Costa Mesa, CA -- MIDAC's Titan-OL systems provide real-time, multi-component extractive gas phase analysis for on-line and continuous multi-point analysis. Results include formaldehyde, NOx, SOx, CO, H2O, CO2, NH3, etc. 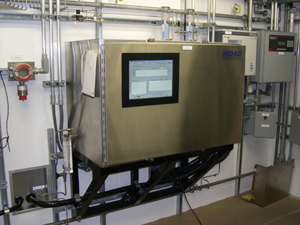 Titan-OL systems include a rugged industrial FTIR spectrometer system, gas cell(s), sample manifold, valve control electronics and software. Hardware is enclosed in appropriately rated NEMA enclosures, (up to and including Class 1, Div 1) or in a standard industrial rack mount cabinet. MIDAC's exclusive fiber optic distribution electronics provide a single hub for temperature, pressure, mass flow, external alarm and optical switching signals and can accommodate up to four 12 port manifolds for a total of 48 sample, purge and calibration lines. Communication between the hub and control computer is over fast, stable fiber optic cable.